Meringues are the foundation of many desserts (at my house in Bologna, we call them “spumini”). They are excellent when crumbled for stuffing ice cream cakes or whole, used as a decoration. They are also delicious eaten alone, perhaps covered with melted chocolate or flavored with coffee. They are simple to prepare, but you must arm yourself with patience and be sure to perform some fundamental steps: let’s see the recipe together! 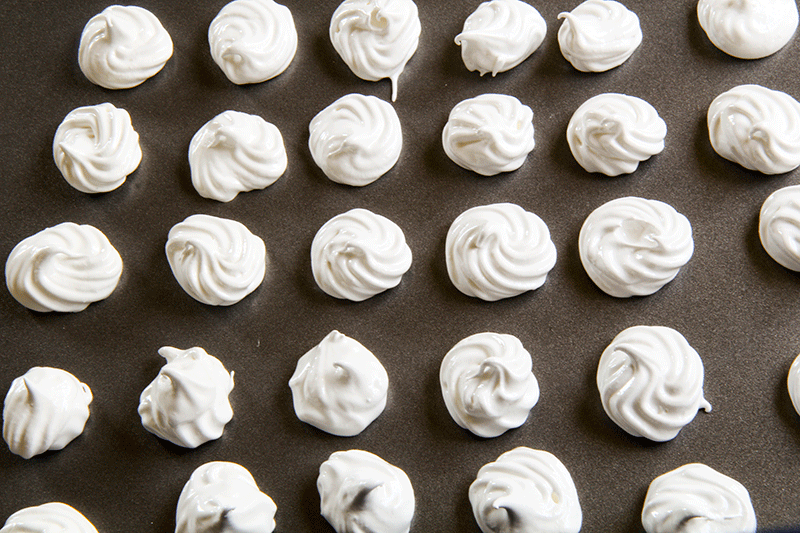 Preparing delicious meringues is not difficult, however a few directions need to be followed precisely! Firstly you must keep in mind the meringue’s two main enemies: fat and moisture. The tools that we will use must be perfectly clean and dry. In order to beat the eggs well, avoid plastic or wooden bowls, which always retain a little fat residue from previous preparations. When you separate the egg whites, be careful not to “dirty” them with traces of yolk, in case you break one, it is advisable to throw everything out and start over. The lemon juice helps to render the meringues glossy once they are cooked, but personally I don’t find this step necessary. As for the salt, I prefer not to add it because it encourages the leakage of liquids, which is to be avoided when you beat the egg whites. Firstly, preheat oven at 160 °F, keeping the oven door half-open to prevent the formation of moisture. To maintain a constant temperature (which may range between 140 °F and 175 °F) I recommend you use an oven thermometer: which is cheap but will prove useful in many occasions. Never exceed 175 °C; the meringues will not have to cook properly, but dry out without turning brown. Remove the eggs from the fridge and let them rest until they have reached room temperature. Separate the egg whites from the yolks (which we will be able to use with the meringues for the preparation of other desserts, such as the LEMON SEMIFREDDO). Add half the sugar to the egg whites and begin to beat with a food processor or an electric beater, then sprinkle the remaining sugar and lemon as the mixture begins to swell. 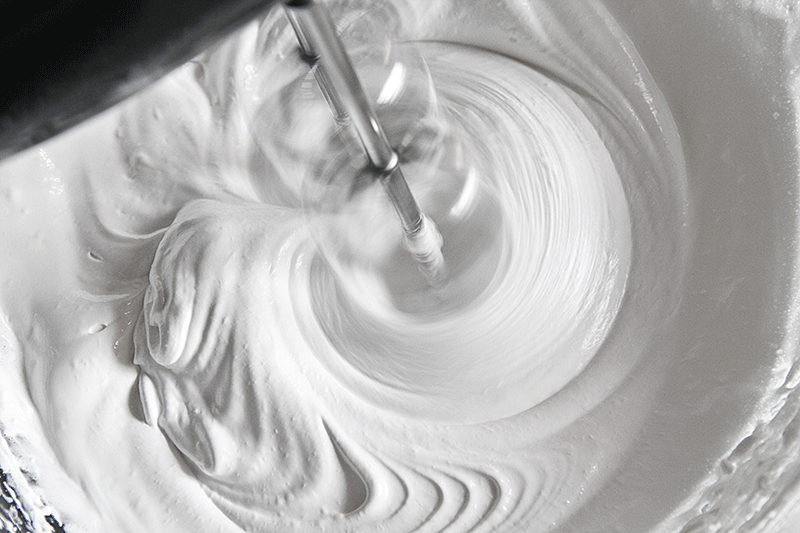 When the egg whites are glossy and firm you will be ready to prepare the meringues. As soon as the mixture is ready, insert it in a pastry bag and form the meringues on a non-stick pastry tray. If you do not dispose of a perfectly non-stick surface, wrap the pan with a sheet of baking paper. A soon as the meringues are ready bake for about 3 hours, then turn off the heat and let stand inside the oven (always keeping the over door semi-open) until they are cold. When the meringues come off the pan without breaking and are perfectly dry inside, they will be ready! 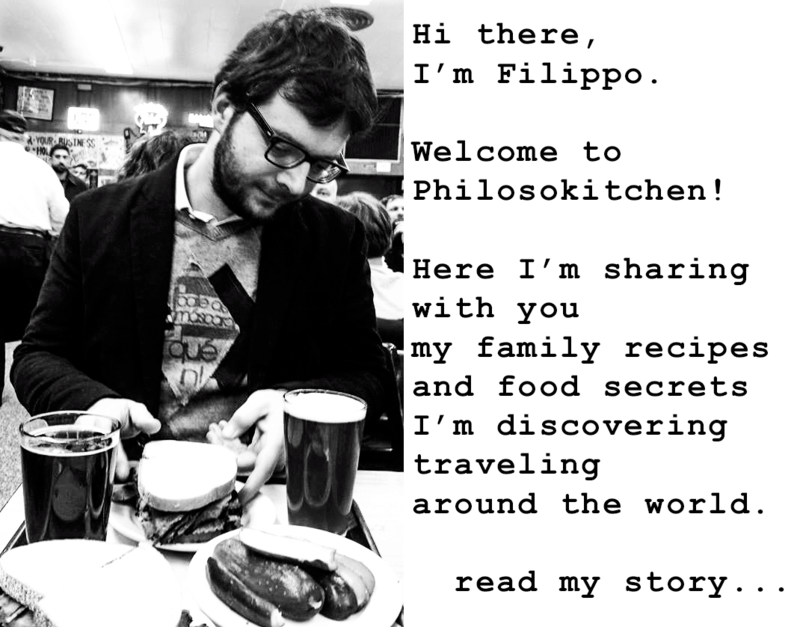 Meringues are the foundation of many desserts (at my house in Bologna, we call them "spumini"). They are excellent when crumbled for stuffing ice cream cakes or whole, used as a decoration. They are also delicious eaten alone, perhaps covered with melted chocolate or flavored with coffee. They are simple to prepare, but you must arm yourself with patience and be sure to perform some fundamental steps: let's see the recipe together! Preparing delicious meringues is not difficult, however a few directions need to be followed precisely! 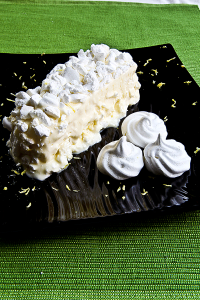 Firstly you must keep in mind the meringue's two main enemies: fat and moisture. The tools that we will use must be perfectly clean and dry. In order to beat the eggs well, avoid plastic or wooden bowls, which always retain a little fat residue from previous preparations. When you separate the egg whites, be careful not to "dirty" them with traces of yolk, in case you break one, it is advisable to throw everything out and start over. The lemon juice helps to render the meringues glossy once they are cooked, but personally I don't find this step necessary. As for the salt, I prefer not to add it because it encourages the leakage of liquids, which is to be avoided when you beat the egg whites. FIRST STEPS - Firstly, preheat oven at 160 °F, keeping the oven door half-open to prevent the formation of moisture. To maintain a constant temperature (which may range between 60 °C and 80 °C) I recommend you use an oven thermometer: which is cheap but will prove useful in many occasions. 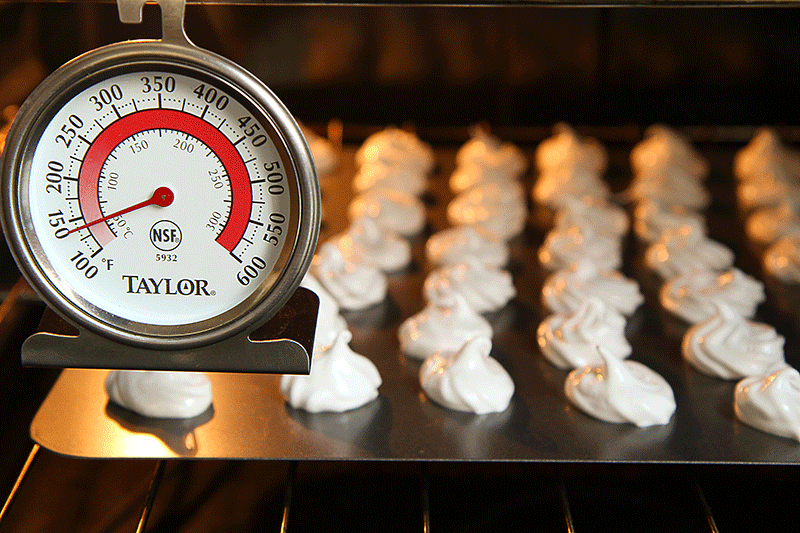 Never exceed 175 °C; the meringues will not have to cook properly, but dry out without turning brown. WHIPPING EGG WHITES - Remove the eggs from the fridge and let them rest until they have reached room temperature. Separate the egg whites from the yolks (which we will be able to use with the meringues for the preparation of other desserts, such as the LEMON SEMIFREDDO). Add half the sugar to the egg whites and begin to beat with a food processor or an electric beater, then sprinkle the remaining sugar and lemon as the mixture begins to swell. 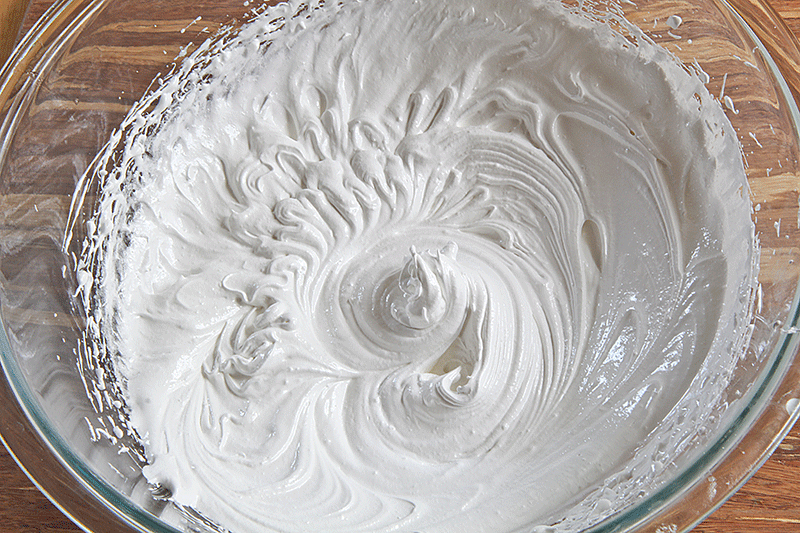 When the egg whites are glossy and firm you will be ready to prepare the meringues. 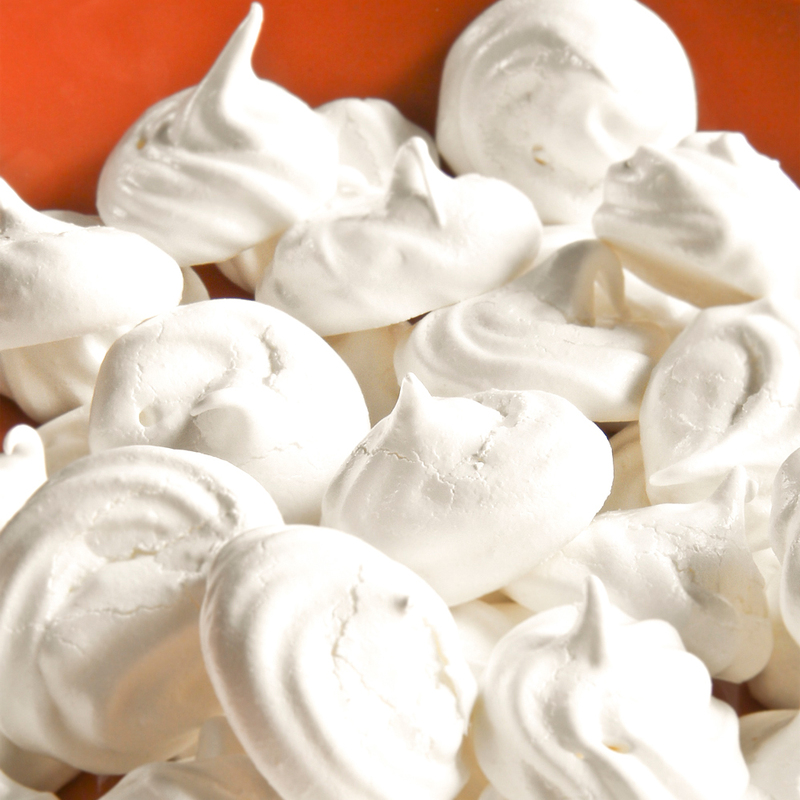 MERINGUES - As soon as the mixture is ready, insert it in a pastry bag and form the meringues on a non-stick pastry tray. If you do not dispose of a perfectly non-stick surface, wrap the pan with a sheet of baking paper. A soon as the meringues are ready bake for about 3 hours, then turn off the heat and let stand inside the oven (always keeping the over door semi-open) until they are cold. When the meringues come off the pan without breaking and are perfectly dry inside, they will be ready!